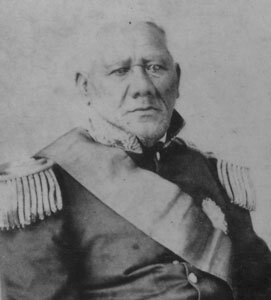 When Lot Kamehameha succeeded his brother Kamehameha IV in 1863, he selected his father, Mataio Kekūanāo‘a to be the Kuhina Nui. Kekūanāo‘a had a long and active career in Hawaiian government affairs. He accompanied Kamehameha II on his ill-fated journey to England in 1823, served in the House of Nobles and the Privy Council, was a governor of O‘ahu, the King’s chamberlain, and president of the Board of Public Instruction. His propitious marriage to Kīna‘u, a daughter of Kamehameha I, made him the father of two kings, Kamehameha IV and V. He was also the father of Princess Ruth Ke‘elikōlani, whose great land holdings would pass to Bernice Pauahi Bishop and become the Kamehameha Schools / Bishop Estate.